JACKSON, Miss. ­– The UM School of Pharmacy’s Division of Pharmacy Professional Development has created a new online portal for continuing professional development programs at pharmacycpd.org. The DPPD spent the past year developing the site that will deliver online educational programs to pharmacists and pharmacy technicians. The online offerings will help combat the cost of conference travel and time away from work, contributing to practice advancement in Mississippi and beyond. “We plan to create a variety of educational programs that are affordable, engaging and available on-demand,” said Stuart T. Haines, director of DPPD and professor of pharmacy practice. 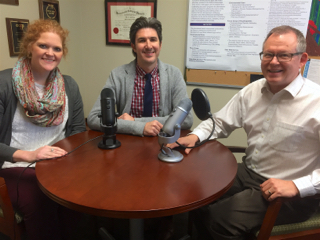 Laurie Fleming, Joshua Fleming and Stuart Haines helped to create the PharmacyForward podcast. In addition to the new site, this year DPPD began producing a podcast about issues in contemporary pharmacy practice called PharmacyForward. It also created a tutorial on “Challenging Student Behaviors” that is free for University of Mississippi School of Pharmacy preceptors who contact the Office of Experiential Programs for a code to waive the $20 fee. Haines credited Gary Theilman, associate professor of pharmacy practice, for helping to develop the website, and Randy Pittman, the school’s Continuing Education Coordinator, for providing guidance on and improving the efficiency of educational programs. “The DPPD’s revamped approach to professional development is fulfilling the needs of pharmacists and pharmacy technicians to more easily engage with educational content online and on mobile devices,” said David D. Allen, dean of the School of Pharmacy. To learn more about the Division of Pharmacy Program Development visit pharmacy.olemiss.edu/dppd. Access their educational programs at pharmacycpd.org.